An event searched for by Sea of Blood can be played in the same reaction window if the triggering conditions are met (Ex: Put to the Sword). Your opponent has the opportunity to trigger a reaction to losing the challenge (Ex: His Viper Eyes) after you trigger Sea of Blood before you can trigger your next card effect for winning the challenge. 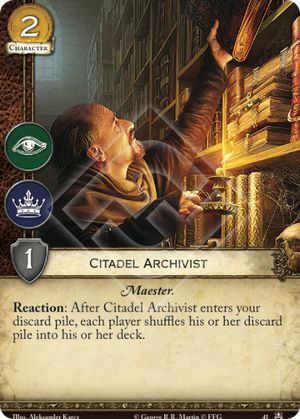 If Citadel Archivist gets pillaged, the first player has the first opportunity to trigger any reactions to Citadel Archivist entering the discard pile. 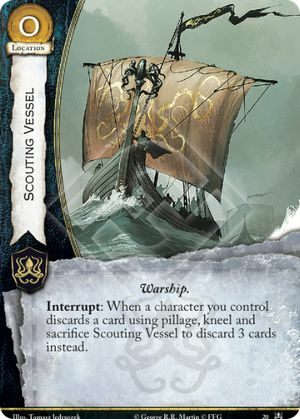 If you trigger more than 1 Scouting Vessel when pillage happens, each Scouting Vessel adds 2 additional pillage. 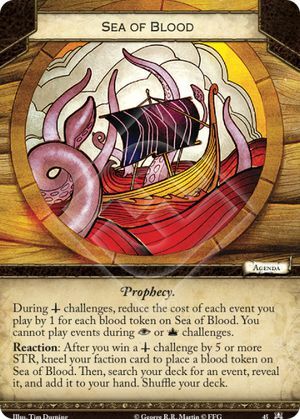 For example, triggering 2 Scouting Vessel will result in 5 cards being pillaged. All pillaged cards enter the discard pile simultaneously. In between each time you want to trigger an ability that reacts to each card being pillaged, your opponent also has an opportunity to react to a card being pillaged. 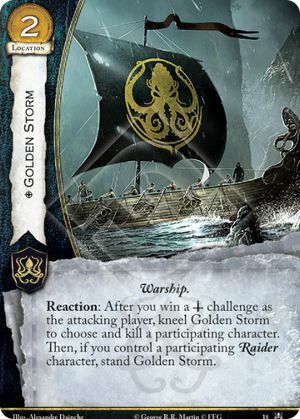 If you win a military challenge with multiple characters that have the Raider trait, you can only trigger Golden Storm once. You can only trigger an ability once per triggering condition. 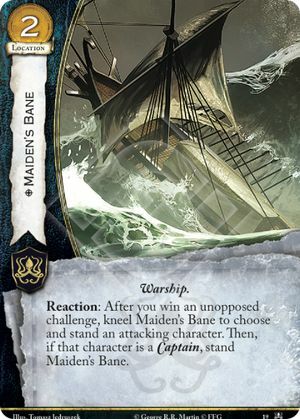 If you win an unopposed challenge with multiple characters that have the Captain trait, you can only trigger Maiden’s Bane once. You can only trigger an ability once per triggering condition.